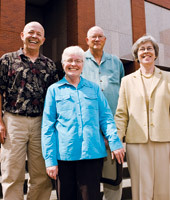 In June 2007, four Seattle Pacific University faculty members with a combined 129 years of academic service packed up their memory-laden offices and began a new chapter of their lives: retirement. Among them was Ruby Englund, associate professor of nursing. Drafted in 1966 into the newly formed School of Health Sciences (SHS), Englund worked to “hand-embroider students” for successful service. Today, as technology dominates our attention, Englund has reminded nursing students it is their job to connect with patients. “People still have to describe what hurts,” she says. Englund chaired every major committee in SHS and served on Faculty Council. In 1990, she created the innovative Nursing Camp for high schoolers, which continues to develop young people’s interest in nursing careers. The 2007 Professor of the Year, Englund leaves SPU with the highest honor that students can bestow on one of their professors. Joining her as a 2007 retiree is Michael Macdonald, professor of German, European studies, and philosophy at Seattle Pacific for 40 years. A supporter of those values which he called “permanent things” in his 1986 Weter Lecture, Macdonald is the founder of SPU’s long-running C.S. Lewis Institute. For years, he even traveled weekly to the Snoqualmie ski area to direct the SPU Ski School. One of Macdonald’s many other contributions to Seattle Pacific has been his involvement with European Quarter, through which he led countless students abroad to discover European cultures and languages. Students say they will miss his caring spirit — and his trademark German hat, complete with feather. Something else that will be missed are Professor of Biology Ken Moore’s legendary lectures in “Anatomy and Physiology.” Many students talk about Moore as their inspiration for careers in medicine, nursing, and pharmacy. In his 32 years at SPU, Moore served six years as chair of the Biology Department and 10 years as coordinator for environmental studies. Perhaps most notable is his work in premed and pre-health career advising. As Moore retires, SPU is enrolling twice as many pre-health students than eight years ago, and the acceptance rate of students into graduate health programs is nearly twice the national average. Also rising is the number of nationally certified nurse practitioners graduating from SPU, thanks to retiring Associate Professor of Nursing Martha Worcester. She began her career at Seattle Pacific in 1989 teaching undergraduate nursing courses, but switched in 1994 to full-time work in the Nurse Practitioner Pathway — a program she helped to develop. Along with mentoring nursing graduate students, Worcester also secured full grant funding to help students focus on an often-neglected specialty: work with elderly populations. “I’m always looking to find places where my abilities and the world’s needs meet,” she says. It’s a life philosophy echoed by each of her fellow retirees.